Believe it or not…this is not about our swings at CNS. This is another swing story. Coincidentally happened on the day the swings came down at CNS, but a different story and reflection altogether. Quick background: along with a few of our teachers at CNS, I have been invited to and participate in a new endeavor formed by some wonderful educators (most notably including Joanne Pressman, my mentor, confidante, friend, and predecessor at CNS). This group has created a series of workshops inspired by two wonderful educators, David and Frances Hawkins. For more info: http://hawkinscenters.org. On Saturday, November 2, I attended one of these workshops at the de Cordova Museum and Sculpture Park. The material of the workshop was inspired by the artist in residence, Orly Genger, who has created some fantastic sculptures out of former lobster trap rope. We were meant to explore and experience the exhibit and then invited to work in a small group with a wide selection of rope, outside in the park, without any guidance or restrictions. The idea was to have us experience, experiment, play. The core mission of this Hawkins group is to have teachers, educators, administrators, to first person engage with materials. This brings us in better touch with our work with children. The idea is that by experiencing first hand what we are asking of the children – that we will have deeper insights, be more sensitive to their experiences, and as an end result be more in touch with our work. And so my group – which included Amy Kvaal, Danielle, Cindy, and another person that was from another school – began to find a spot (we chose a tree) and gathered up some good choice rope. 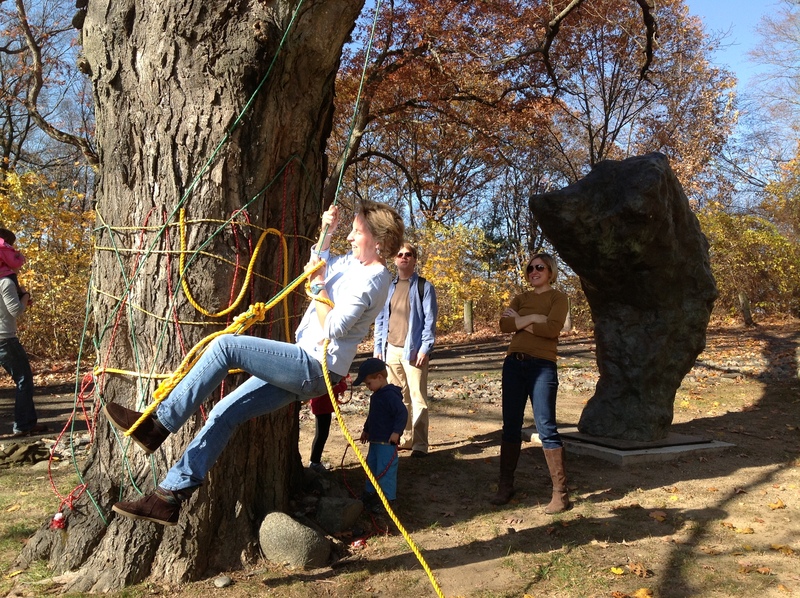 At first we were busy ‘decorating the tree’ – weaving different colors and lengths of rope around its trunk. But then we became interested and inspired by a branch and we wondered if we could weave a section up and over the branch. It took some doing – but once we had it over – then of course, the idea of a rope swing came right to us. I grew up with a rope swing. It was located at the very back back of my yard and I used that rope swing all the time. I loved to swing. And spent many hours back and forth – pushing off the great big tree and allowing my mind to wander. The video attached here will tell the next part of the story. We did have success. And for a few minutes, we had joy. I was flying. I took a risk that the branch would hold my weight (literally figuring out if I did indeed fall, would have time for an ER visit before leaving for NY later that day to catch my friend running the marathon). The branch held my weight. And I flew. Transformed. It was a lovely antidote knowing that I had left CNS only an hour earlier having given the work day list including ‘take down our swings’. The director of the educational program at the deCordova – a super nice person and thoughtful, inspired educator, came over to tell us to stop. I don’t know if she was worried about our safety, the tree, or the spectators wanting to try out our swing (there were regular museum guests at the deCordova on this day as well -along with a reception ongoing on the adjacent lawn). My guess is that it was a struggle for her to ask us to stop – but I can tell you that as soon as she did….it was a complete and total buzz kill. I felt like I was five years old again. And so the workshop did what was intended – it helped me to see how it is that children so often feel when we give them a little freedom – but then need to “rope” them in when they push the boundaries just a little too far. It happens for us as parents, teachers, all the time. That project that turns just a little too messy and we need to redirect the energy; or the song that gets just a bit too loud with their enthusiasm and big voices. The purpose of these Hawkins experiences is to help us gain insight into our work with the children – and it absolutely did. Once the person curtailed our swinging, we were deflated and done. We didn’t even want to play any more. There was a sense of shame and sadness. One minute, joy and flying; the next minute a sense of needing to apologize and pull down the rope. I suppose what we were doing was dangerous- we could have fallen; the branch could have broken. Other museum guests might have taken up the swing after we were done. There was liability. But before that adult sensibility – there was flying, and weightlessness, and joy. And so I have held that in my heart all week. Thinking about how it is that we create experiences at CNS – that we invite the children to explore, experiment, and try. And how I want us all to be self-conscious about those moments when we need to redirect or reboot their enthusiasm – maybe out of a concern for their safety; or maybe because we are worried about the example they are setting and of things getting ‘out of control’. But let’s try not to deflate their creativity or their ingenuity. Let’s find gentler ways to redirect – that appreciates their inspiration without deflating their effort and spirit. It was a good experience for me to feel like I was five years old and in trouble once again. What a beautiful and poignant article Liz. Thank you for reminding me to let my children’s creativity soar.